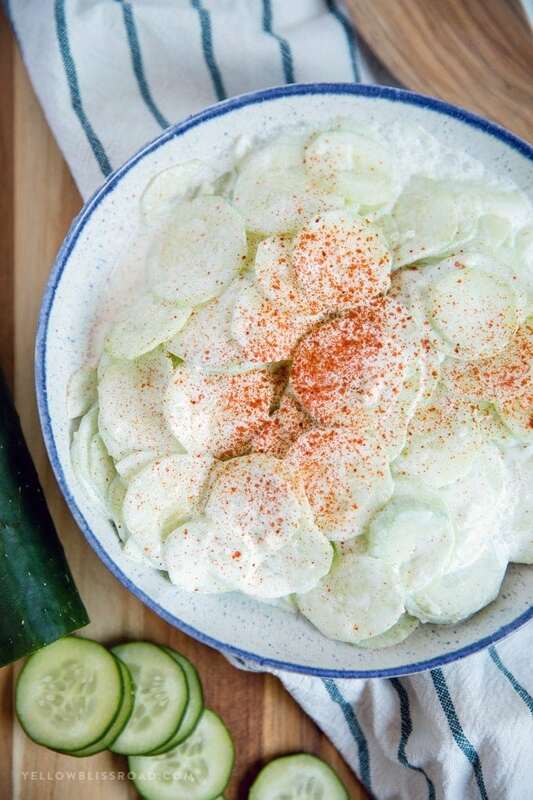 My Oma’s Creamy Cucumber Salad (Gurkensalat) is full of crisp, crunchy cucumbers, tangy vinegar and spicy garlic, all coated in smooth sour cream. 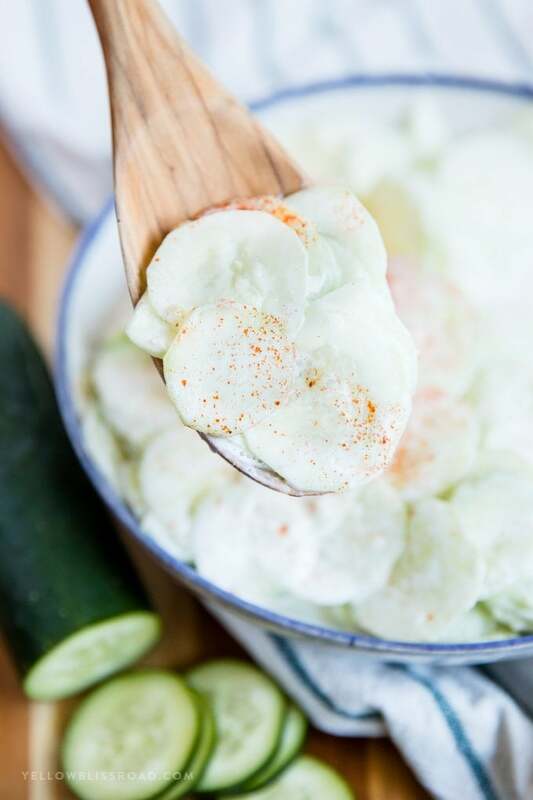 It’s a perfectly refreshing side dish for spring and summer. Food is important in our family. 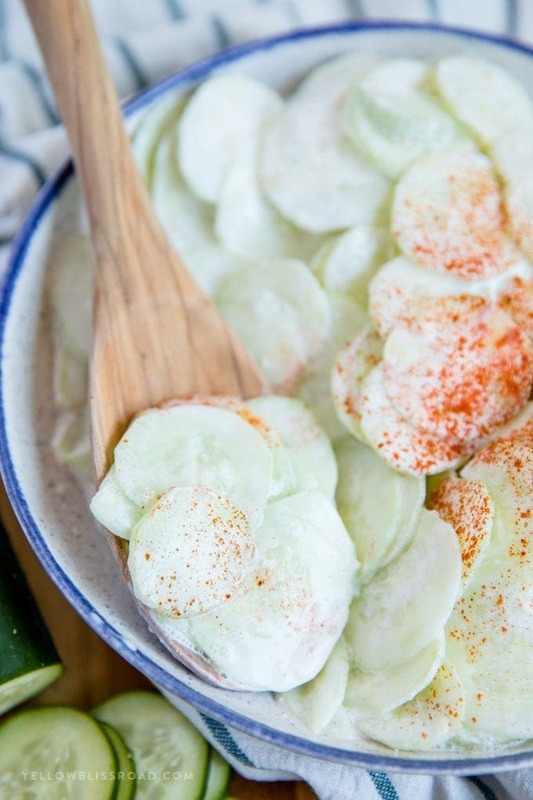 The kitchen is where we connected, over German Potato Salad and Scalloped Potatoes. 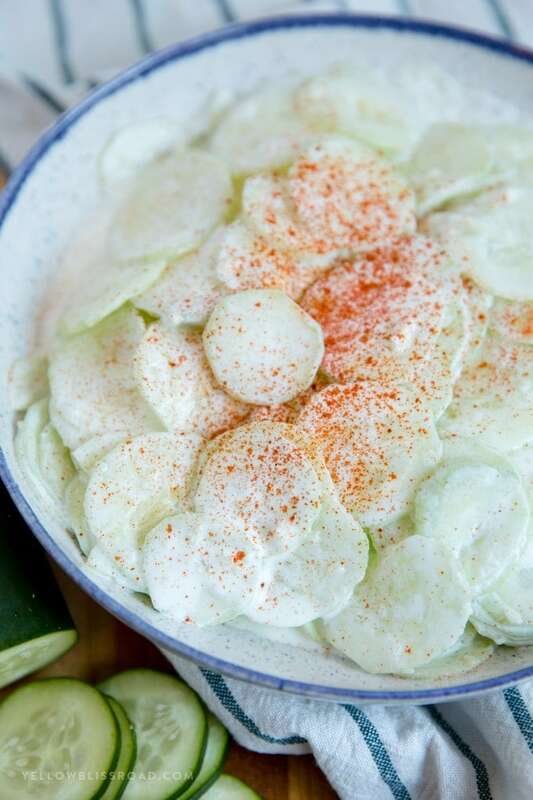 My Oma’s Creamy Cucumber Salad is a recipe she carried with her for over 50 years, tweaking it here and there, and it’s been my nemesis for as long as I can remember. My grandma would make it and I’d refuse to eat it. My mom would make it, and even as an adult I’d refuse to eat it. My daughter on the other hand loves the stuff. I mean “can I have it for snack?” cannot get enough! It wasn’t until recently that I wanted to add it to the site, since I do love chronicling our family recipes here. I knew that if I was going to share it with you though, I was going to have to eat it. I bravely took a bite, and realized that I’d been crazy to refuse it all those years! 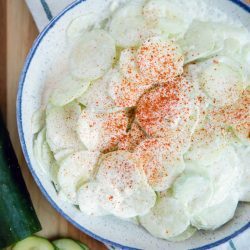 Our Cucumber Salad recipe is a little different from other recipe, as is typically with our family recipes. My grandma always liked to try and make things simple, which is pretty much my favorite word. We don’t add onions, which most recipes do. But in it’s place we like lots of garlic. You could totally add onions if you like though. We also ad just a pinch of sugar for sweetness and some paprika for color; both are completely optional. Slice the cucumbers nice and thin. I recommend using a mandolin if you’ve got one. (aff) The thicker the slices, the harder they are to eat. Don’t add salt to the cucumber salad until the very end. When the salt hits the cucumbers they begin releases their juices, which will just make the sauce super thin. Let this creamy cucumber salad sit overnight if you can. It will taste great if eaten immediately, but after sitting for a few hours the flavors have time to blend and mature and you’ll get a nice kick of heat from the garlic and tang from the vinegar – almost like pickles! Peel cucumbers and slice very thin (a mandolin is great for this). Stir in garlic. Sprinkle with salt and sugar and stir to combine. Stir in sour cream to coat. Sprinkle some paprika on top for color, if desired. Chill at least one hour or until ready to serve. It tasty and suitable with weather where i am living. And simple to make it. Thank for your sharing! use a mandolin or even a vegetable peeler and make healthy noodles out of it! Stay tuned for a recipe!